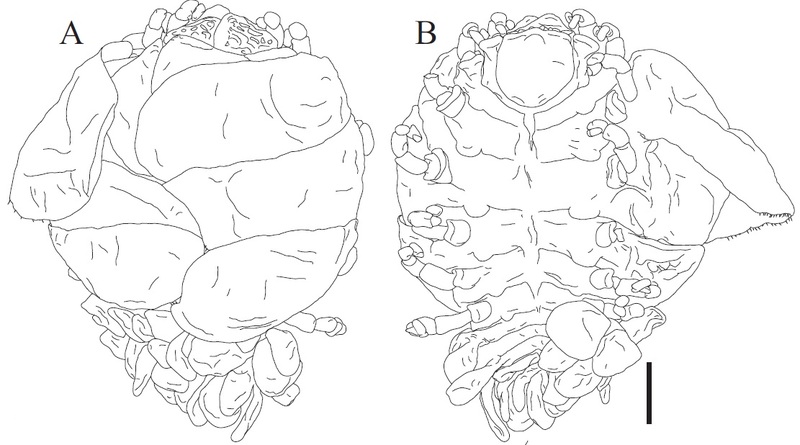 Sciency Thoughts: Parasitic Isopod Crustaceans from the Philippines, Australia and Taiwan. 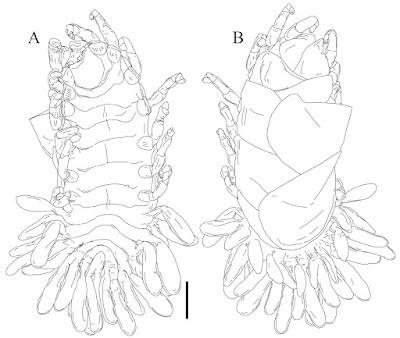 Parasitic Isopod Crustaceans from the Philippines, Australia and Taiwan. 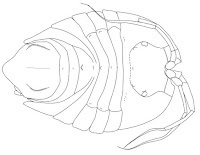 Bopyrid Isopods are parasites infesting the bodies of other marine (and occasionally freshwater) Crustaceans. About 800 species have been described, with maximum diversity thought be found in the Indo-Malay-Philippines Archipelago, where it is predicted that many undescribed species will be found. 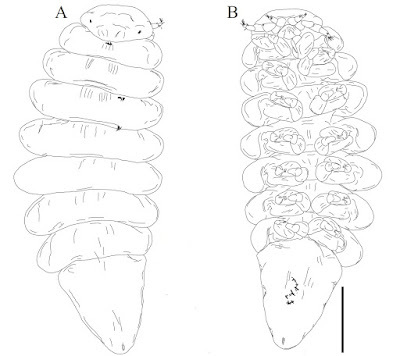 Most Bopyrids are found within the branchial (gill) chambers of their hosts, though members of the subfamily Athelginae attach to the abdomens of Hermit Crabs, a group particularly prone to parasite infections. 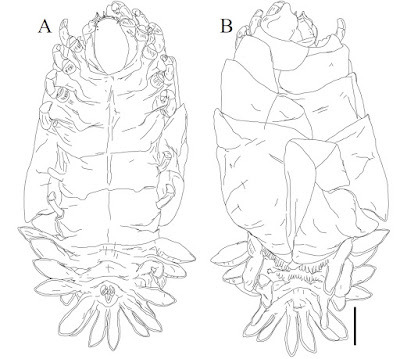 In a paper published in the Raffles Bulletin of Zoology on 29 February 2016, Jason Williams of the Department of Biology at Hofstra University and Christopher Boyko of the Department of Biology at Dowling College describe four new species of Athelgine Bopyrid Isopods from the Philippines, Australia and Taiwan. Williams and Boyko inspected 2175 Hermit Crabs collected from the shallow subtidal zone at several sites in the Philippines, as well as museum specimens from Australia, Papua New Guinea and Taiwan. 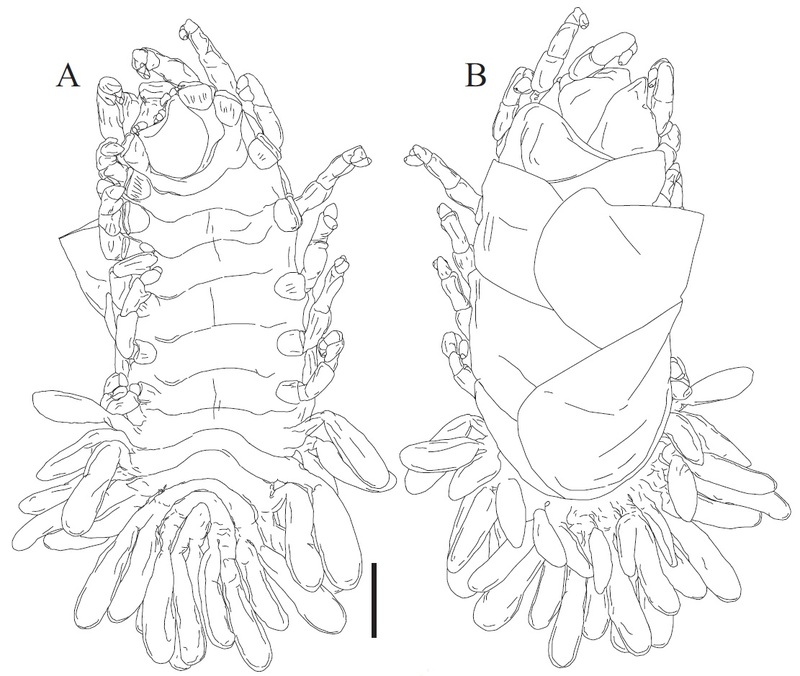 A total of three new species of Athelgine Bopyrid Isopods were found in the Philippine material, one of which was also found on a museum specimen collected in Taiwan, while a fourth new species was discovered on an Australian Hermit Crab in a musuem collection. The first new species described is placed in the genus Allathelges, and given the specific name alisonae, in honour of Alison Carson, the wife of Jason Williams, who helped collect much of the Philippine material. This species was found infecting Hermit Crabs of the species Dardanus lagopodes (Hairy Red Hermit Crabs), from Batangas and Cebu provinces in the Philippines. The species is strongly sexually dimorphic (i.e. the different sexes are not the same size and shape), with females reaching a maximum of 11.75 mm in length while males reach only 3.0 mm. 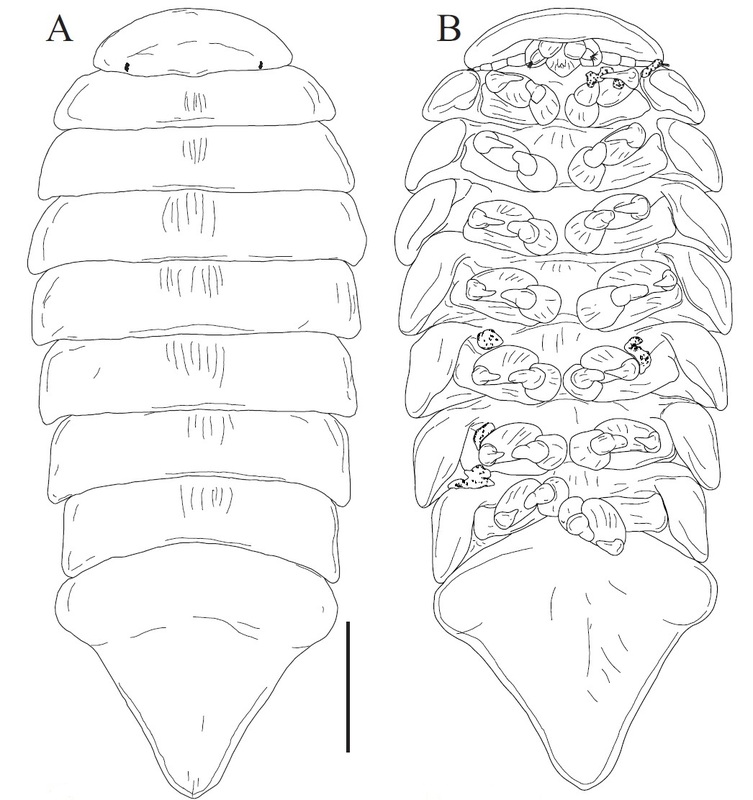 Allathelges alisonae, female in (A) ventral view and (B) dorsal view. Scale bar is 2 mm. Williams & Boyko (2016). Females of this species lack eyes, and have a pleon (tail section) with unfused segments, while the males retain eyes and have pleons formed of fused pleons. 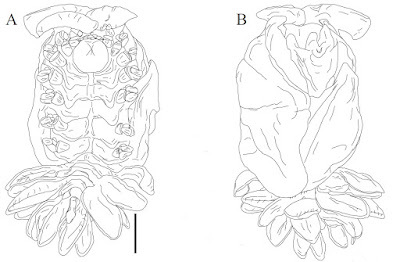 Allathelges alisonae, male in (A) dorsal view and (B) ventral view. Scale bar is 500 μm. Williams & Boyko (2016). 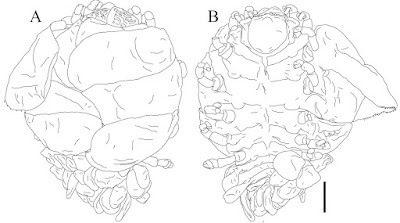 The second new species described is placed in a new genus, Claustrathelges, which is a combination of Athelges, a previously described species and 'claustrum' a Latin word for prison, in reference to the fact that the parasites are trapped within the Hermit Crab's home. The species is given the specific name macdermotti, in honour of John McDermott, Emeritus Professor of Biology at Franklin and Marshall College in Pennsylvania, for his work on his work on marine invertebrates in general and Bopyrids in particular, and in recognition of the fact that Williams and Boyko found a species previously named after him to be invalid. 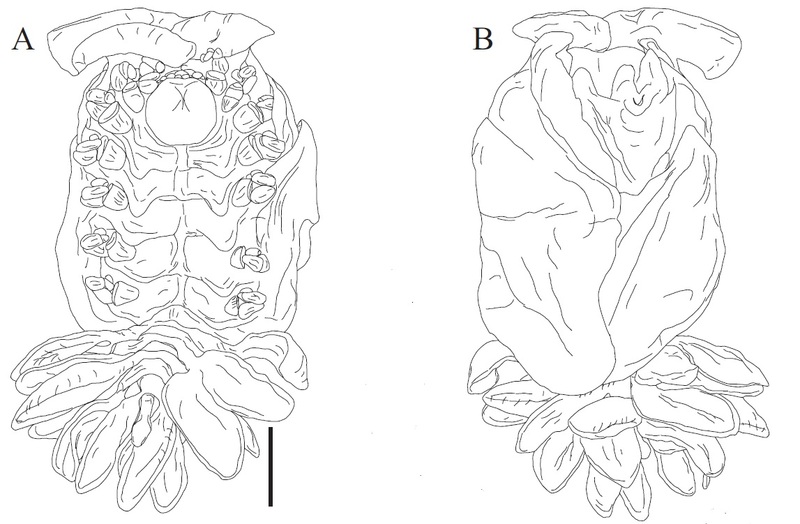 Claustrathelges macdermotti, female in (A) ventral view and (B) dorsal view. Scale bar is 2 mm. Williams & Boyko (2016). The species is decribed from a single female specimen from a museum specimen of Cancellus typus (the Minor Hermit Crab) collected from San Remo Channel in Victoria, Australia, in 1978. The specimen is 14.4 mm in length, and has a maximum width of 8.2 mm. It lacks eyes. The third species described is placed in the genus Falsanathelges, and given the specific name mariae, in honour of Maria Spector, the wife of Christopher Boyko. The species was found on several different Hermit Crab species from Oriental Mindoro and Cebu provinces in the Philippines, as well as museum specimens of Calcinus guamensis (the Guam Hermit Crab) from Taiwan. 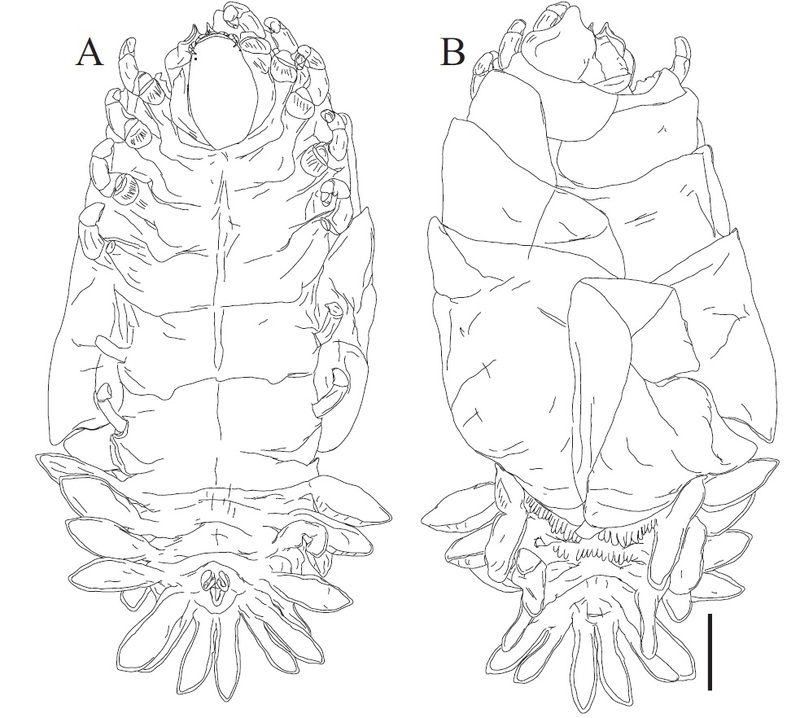 Falsanathelges mariae, female in (A) ventral view and (B) doesal view. Scale bar is 1 mm. Williams & Boyko (2016). Females of this species reach 9.67 mm and males 4.47 mm. One of the female specimens examined hosted a smaller parasitic isopod of the genus Cabirops in its brood chamber (parasites which infest other parasites are referred to as hyperparasites). 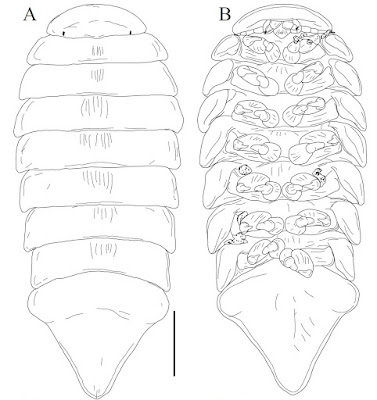 Falsanathelges mariae, male specimen in (A) dorsal view and (B) ventral view. Scale bar is 500 μm. Williams & Boyko (2016). 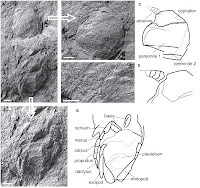 The final new species described is placed in the genus Pseudostegias, and given the specific name trisagitta, meaning 'three-arrows', in reference to a distinctive structure on the ventral surface of one of its segments. This species is described from a single female specimen 8.9 mm in length found on a Crab of the species Calcinus minutus (the Small White Hermit Crab) at Coco Beach in Oriental Mindoro Province. 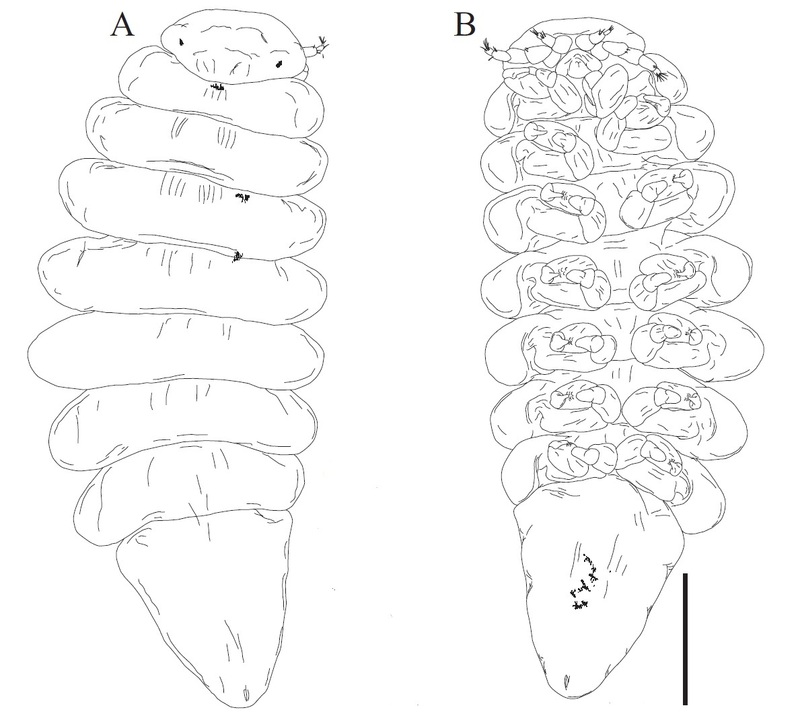 Pseudostegias trisagitta, female specimen in (A) ventral view, and (B) dorsal view. Scale bar is 1 mm. Williams & Boyko (2016).